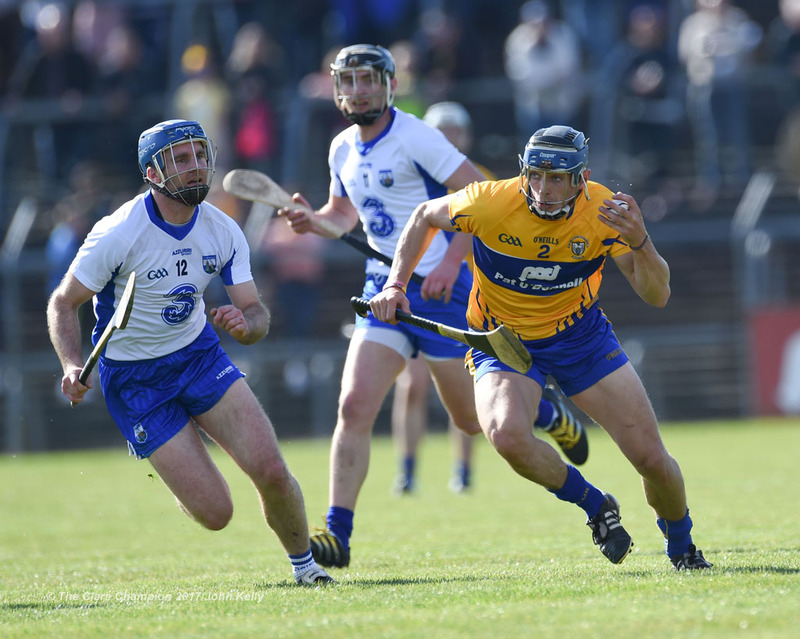 David McInerney of Clare in action against Michael Walsh of Waterford during a National League game at Cusack Park. Photograph by John Kelly. AS the clock ticks closer to the Munster senior hurling final, one of the big talking points is the likely line-up of the side to face Cork. David McInerney is winning his battle to be fit, having suffered a hamstring injury when playing for his club Tulla in a Clare Champion Cup tie almost four weeks ago. He played in an internal game on Sunday last and is expected to be named at full-back on Sunday. Oisin O’Brien has returned to action after a near six-month lay-off due to a knee injury suffered at the beginning of the season. He has participated in training and internal games for the past few weeks, while he played a full league game with Clonlara two weeks ago. Recognised as a leading man-marker, there is much speculation that he will be in the starting line-up and given the task of following Conor Lehane, who has sparkled for Cork in their two championship games to date. 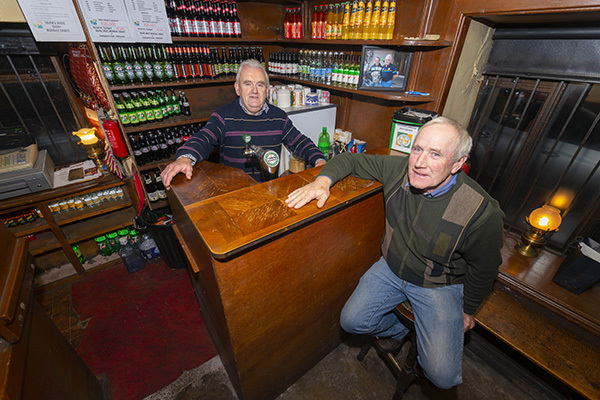 There is also strong speculation that Clooney-Quin’s Peter Duggan will be in the team. He is understood to be in tremendous form at present and, according to reports, scored four goals and a number of points in an internal game two weeks ago, when the squad trained in Ennistymon. I watched training for a while last week following the media evening at Caherlohan and in a 10-minute spell he found the net three times. If he doesn’t start, it seems safe to predict that he will play some part in Sunday’s game. Whether or not last year’s captain Cian Dillon will win back a place in the starting line-up is another matter. The Crusheen man was left out of the team for the Limerick game. He is reported to be pressing strongly for a starting place this week. Another talking point concerns the position between the post but Andrew Fahy is expected to again be named. In the last round of Clare Champion Cup games two weeks ago, both Pat Kelly (Inagh-Kilnamona) and Donal Tuohy (Crusheen) were released to play with their clubs but Fahy, like the majority of his inter-county team mates, was not available to Whitegate. There is no denying the fact that Cork have been the most impressive of the two finalists. It was a huge surprise when they comprehensively beat the defending All-Ireland champions in the opening round and they maintained this form when they disposed of another of the favourites, Waterford, in the semi-final. That Clare deserved their win over Limerick in the semi-final is without question but it took the Banner men a long time to seal that victory. They allowed Limerick back into the tie on a few occasions, before finally capturing the honours. A repeat of that form could certainly prove very costly. Cork have a key figure in goalkeeper Anthony Nash. In addition to being an outstanding shot-stopper, his distribution from general play and, particularly, from puck-outs has played a key part in their success to date. Clare will need to devise some strategy to disrupt this, if they are to have a chance of winning. If there is an area for concern for Cork, it is in defence and Clare will be hoping to trouble the Leesiders in this area through Conor McGrath, Shane O’Donnell, Podge Collins and John Conlon, who are among the best forwards in the game. Mark Coleman has excelled for Cork in defence this year and they will also be looking to Stephen McDonnell, Mark Ellis and Christopher Joyce to curb the Clare forwards. Similarly, there is some concern with regard to the Banner County’s defence, which has struggled a little this season. They will have to be at their best this week if they are to cope with the threat posed by Conor Lehane, Alan Cadogan, Patrick Horgan, Shane Kingston and Seamus Harnady, a sector that has been outstanding in the Leesiders’ march to this final. A fully fit David McInerney is crucial to Clare’s chances and they will also look to Seadna Morey and David Fitzgerald in this sector. Positions may mean little in this final, as the respective managements are likely to opt for special man-marking arrangements. There is speculation that Clare may opt for a return to a partnership that has inspired a lot of success for the county by naming Tony Kelly and Colm Galvin at midfield. While both have, in recent times, been somewhat below the high standard they have set since their minor days, there is no doubting the fact that they are two of the best players in the game, with the ability to dominate any opposition. On the evidence of their form so far, it’s understandable that Cork hold the favourites’ tag. There is a wealth of experience in this Clare line-up, which will include almost half of the team that defeated Cork in the 2013 All-Ireland final. However, one cannot get away from the fact that Cork have been hugely impressive and will be extremely difficult to beat. Clare will need to improve on their semi-final form if they are to end a 19-year wait and bring the Munster senior title back to the Banner Count. Clare defence must step up to the plate if thye 19 year gap to a Munster hurling final win is to be bridged.